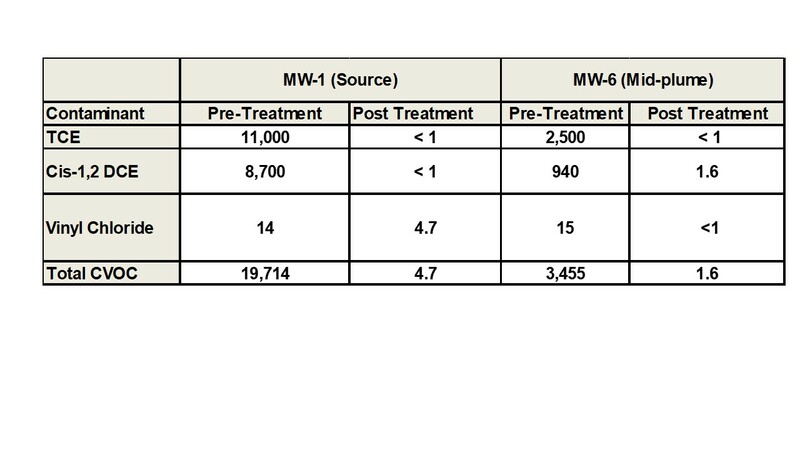 Recent data from field applications of Petrox bioremediation show degradation rates of 100 to 500 micrograms per liter (ug/ml) per day. These degradation rates are for total petroleum hydrocarbons or total BTEX, depending on the site monitoring requirements. Achieving high degradation rates requires high initial concentrations. Initial concentrations of 1,000 to 10,000 ug/l were used to develop these degradation rates. At lower concentrations, the degradation rates depend on effective distribution of microbes for cell to contaminant contact. Secondly, desorption of petroleum constituents from submerged soil may cause rebound and suggest lower degradation rates. For these reasons we cannot calculate a degradation rate for petroleum at low concentrations. CL-Out® bioaugmentation was implemented in combination with dual phase extraction at an industrial site near Houston, Texas to remove trichloroethylene (TCE) from ground water. The overlying contaminated soil was excavated, but perched ground water and a deeper aquifer had TCE concentrations greater than 10,000 µg/L. A dual-phase vacuum extraction system was installed to control the ground water gradient and increase distribution of the CL-Out® organisms in the aquifer. The TCE concentrations were reduced by 99.9% in one year. The site is located on coastal plain sediments characteristically interbedded sands, silts and clays. The first impacted ground water was a thin perched layer 16 to 18 feet below ground surface. A more transmissive, water bearing zone was at 25 to 30 feet deep. Both water-bearing layers and the interbedded fine-grained layers had TCE concentrations above regulatory standards. High concentrations of TCE were present in perched and deeper ground water. Prior to treatment, a small area of soil less than 500 square feet had TCE concentrations greater than 20,000 µg/L. The underlying impacted perched ground water area was the same size and had TCE concentrations up to 30,000 µg/L. The TCE migrated laterally in the underlying deeper ground water where the TCE concentrations were greater than 10,000 µg/L. The area of the deeper ground water plume was approximately 30,000 square feet. The contaminated unsaturated soil was excavated for treatment to the perched ground water. The perched ground water was treated by a combination of potassium permanganate and vapor extraction. The deeper aquifer was treated by a combination of dual-phase extraction and CL-Out® bioremediation. CL-Out® was applied eight times between January, 2010 and February, 2011. During each application 55 to 110 gallons of CL-Out® was injected into the ground water. The dual-phase extraction system was used to control the ground water gradient and induce greater distribution of the CL-Out® microbes. Periodic plate count analysis of the microbial population in the treated aquifer was completed to guide where and when the CL-Out® population should be supplemented. The repeat applications were on approximately 4 to 6 week intervals. Following one year of bioaugmentation, the contaminant concentrations were reduced by more than 99%. The daughter products caused by incomplete natural breakdown were removed as well as the TCE. The following table shows the contaminant concentration trends in the treatment area. A bench-scale study demonstrated the viability of bioremediation of chromium contaminated ground water. The key factor to successful bioremediation was the selection of chromium-tolerant microbes. Actual contaminated ground water samples for the test. The ground water contained total chromium of 280 mg/L, with 270 mg/L hexavalent chromium. The original sample was split into four bottles, with one preserved as a standard. Three split samples were treated with different blends of microbes. All three of the treated samples showed a reduction in the total dissolved chromium and nearly complete conversion from hexavalent to trivalent chromium. The average total chromium concentration in the treated samples was 160 mg/L and the hexavalent chromium concentration was 0.017 mg/L in two of the three treated samples. 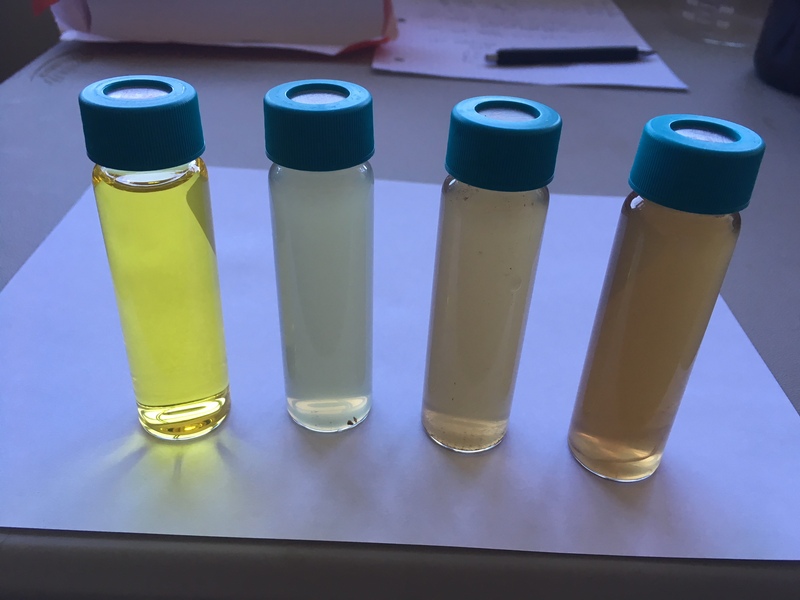 The sediments were not isolated for testing due to the small volume of sediment in the sample bottles. The photograph shows the untreated chromium-contaminated water on the left. The three bottles to the right were treated with various microbial blends. A 30 acre bulk fuel facility is ready for reuse after remediation of nearly 100,000 tons of petroleum-contaminated soil in an urban setting near Los Angeles. Bulldog Green Remediation of Walnut Creek, California used a proprietary ex situ treatment process combining Petrox organisms in a custom blend to remediate the soils. All soil was treated and reused on site. This closed-loop process eliminated 8,000 truck loads of soil from the roads and landfills in southern California. The treatment process reduced contaminant concentrations from typical levels of 1,000 to 10,000 mg/kg to less than 100 mg/kg in less than 30 days. This rapid treatment rate made possible continuous cycling from excavation, through treatment, and back filling. The site is now ready for reuse as a park and other development.